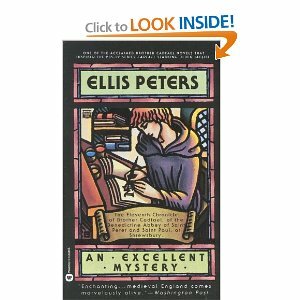 Thus begins An Excellent Mystery, the eleventh novel in Ellis Peters’ Brother Cadfael series. King Stephen and the Empress Maud are battling back and forth across the country for the throne of England, and some of that wartime detritus washes up on the shores of the abbey of Saint Peter and Saint Paul in Shrewsbury in the form of two monks, Brother Humilis and Brother Fidelis, neither of whom is quite what they seem. The abbey takes them in, with unexpected results. It is left to Brother Cadfael to solve an excellent mystery, as well as orchestrate the brief yet worthy return of one of my favorite recurring characters in the series, Sister Magdalen, that ex-baron’s mistress who here plays the part of the goddess in the machine, descending into the last act to resolve all conflicts, answer all questions (if not necessarily truthfully) and make young lovers happy. One of my comfort reads, and a permanent resident on my bookshelf, along with the rest of the Brother Cadfael novels. Always time for that! Although I especially love reading him around springtime for Peters’ wonderful descriptions of green and growing things. Brother Cadfael is one of my “comfort reads” too. It’s so nice to know that you, who are a favorite author of mine, enjoy that series. That’s pretty good company you have me keeping, Maryedith. Thanks!